Day 26: Magic Reindeer Food! Today I'm sharing a fun little project you can make with the kids or to GIVE to the kids.. it's Magic Reindeer Food! 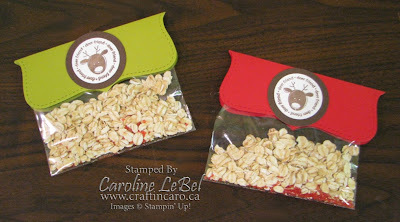 Don't tell them, but it's just some rolled oats and cake sprinkles bagged up with a cute stamped topper. 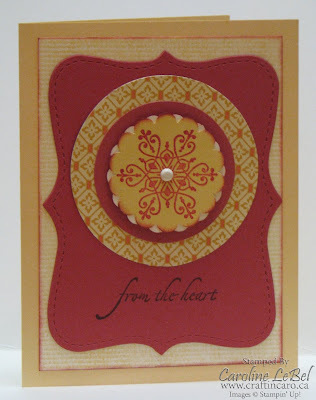 Yes, that's the Top Note die folded in half again -- I don't know what I did before I had my Big Shot! Wow! We're already half-way through my 50 days of Holiday Extravaganza ideas... time sure is flying. 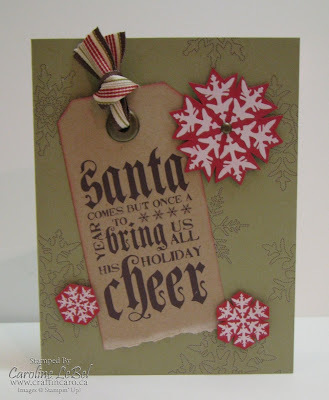 Today's idea uses the "Holiday Treasure" Designer paper paired with my "Top Note" Bigz Sizzix die. I covered small Hershey Nuggets in the paper and created little baggies of them, with a folded over "Top Note" piece. But then what to do with all those negative pieces of the Designer paper after you've cut out the centre? 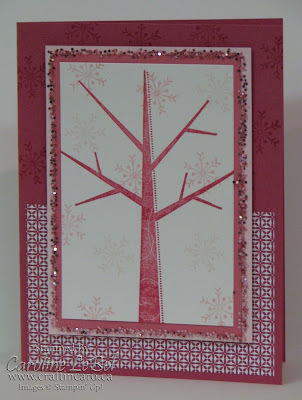 Well, I paired them with the "Thanks" sentiment from the Illuminations set, and added a bit of glitter to make a simple but striking matching card! I'll be selling cards and other fun holiday treats at the Hospital for Sick Kids with my friend Christyne on Monday -- if you're in the Toronto downtown core, please stop on by! You're probably getting bored of me saying it, but I *love* rub-ons! They're just so stinking easy to use...and I do like easy. Don't forget the 20% off RUB ON's special....good through Nov. 30! Go ahead and throw one in your shopping cart if you're taking advantage of my free S&H special. My #1 recommendation? 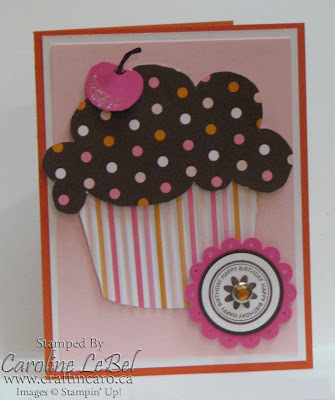 I think the Chit Chat one is an especially fabulous deal with oodles and oodles of handy sentiments to use in both White and Chocolate Chip. Thanks so much to everyone who sent birthday wishes to my little miss Serena yesterday! Hard to believe she's 11 years old now - she's already in a size 9 shoe and inching up closer to her mom's 5'4" faster then I would like!!!! And yes, she thought that "Twilight" was da bomb and wants to go and see it again soon. Aie carumba! 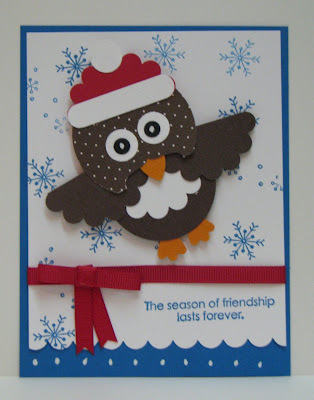 Day 23: Punch Owl & "Breakfast Television"
Today's Holiday Extravaganza sample comes from my friend Dina. 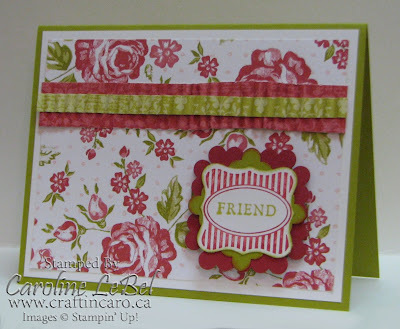 She's a very talented stamper and I'm also lucky enough to have her as part of the "Canadians, INK!" team too. 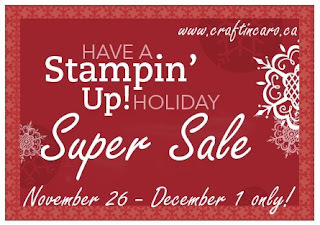 If you've ever had a chance to meet Dina at a Stampin' Up! event like Convention or Regionals, you know just how much fun and enthusiasm she's filled with. We're currently working on trying to get her to Leadership in Orlando... keep your fingers crossed. Florida will never be the same if she gets to go spread some stampin' magic there!!! 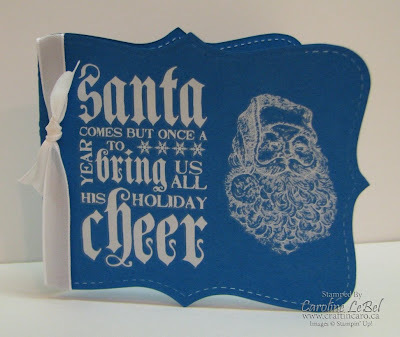 She brought this swap card for all of us at the most recent get-together and I knew I'd have to feature it here for my blogging friends to see! BTW, can you figure out all the different punches that were to make this owl? I was astonished when I tried to mentally recreate it -- there's LOTS! As for my news... 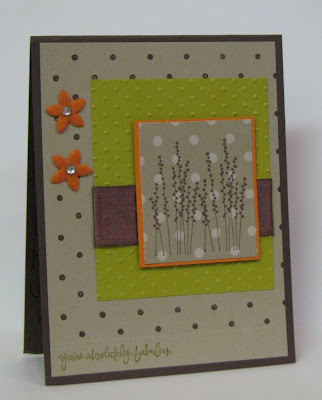 I've been asked to showcase Stampin' Up! projects on Breakfast Television next week, how cool is that? I did a Mother's Day Segment on Rogers Cable back in April, so at least I already have some live TV experience. But BT is filmed live in front of a studio audience, so that will make it even more exciting. If you're in the Toronto or GTA area, be sure to check it out next Friday morning! SUPER SALE & FREE SHIPPING and HANDLING! For a limited time, you can purchase any of the Holiday Extravaganza bundles at a special promotional price -- from 20 to 50% off! To see the fabulous bundles... just click HERE to view them online or else HERE for a handy .pdf flyer. As a special "THANK YOU" from me, you'll also receive FREE SHIPPING from me for any Canadian order when you include any of these bundled offers with your order (online orders will have S&H reimbursed). This sale only lasts till Monday December 1 and quantities are limited, so please place your order early to avoid disappointment. Remember, all orders over $200 also include exclusive free stamps & merchandise -- why not take advantage of this great deal and stock up?! 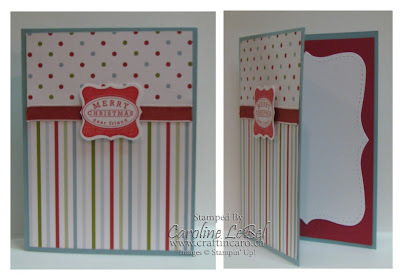 And what with the Curly Label punch being on sale, take a look at two of the Thursday "Curly Punch Bundle" class cards ... enjoy! 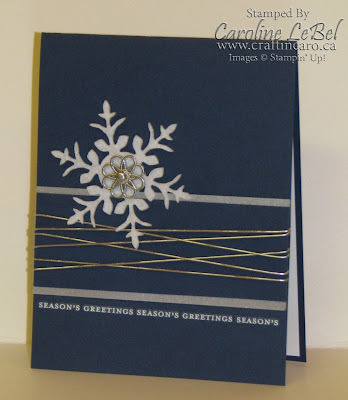 Day 22 : "Curly Label Punch" meets "Holiday Trinkets"
You could very easily punch a small hole in the corner and run some gold elastic cord through it in a loop, to create a small tag. The 3"x3" size means they make great gift enclosures plus they fit our wee envelopes too. With a dash of our Dazzling Diamonds to highlight the images, you have just enough bling to please your recipient with! And before you ask, yes... we are making these at tomorrow's class! 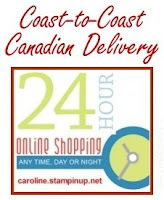 If you haven't checked it out yet, Canada Post's website has an online guide for Holiday delivery. 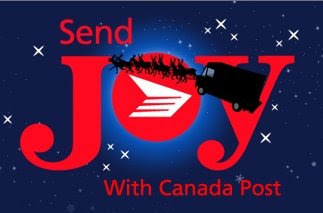 Basically, if you are using Lettermail to send your cards in Canada, Dec. 18 is your deadline for a December 24th delivery if sending WITHIN your province, Dec 17 if sending to outside. 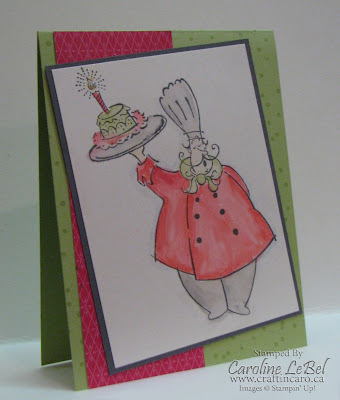 If you're sending cards to the US, C.P. recommends December 10th. AND HERE'S SOME GREAT INFO FOR YOUR KIDS! Did you know that your children can send mail to Santa, no matter where you live in the world and he'll respond? Absolutely! The Santa Letter-writing Program brings joy to children from across Canada and around the world. In addition to giving many children their first introduction to letter writing, this program is also a very important part of the holiday season for thousands of Canada Post employees and retirees. Currently, more than one million children write to Santa at his 'NORTH POLE H0H 0H0' address. Each letter that includes a return address receives a reply from Santa. More than 11,000 current and retired Canada Post employees, affectionately called Postal Elves, help Santa to ensure that every child's letter gets an answer in the language in which the letter was written, including Braille (emails are answered in English or French). Encourage your children and students to write to Santa. It is a fun learning experience that helps teach kids how to write and send a letter. To ensure that children will receive a reply from Santa before Christmas, they should write as early as possible. Remember to include your return address. Teachers are urged to send their classroom letters by December 5. Although Santa loves to receive letters and drawings, putting cookies and treats in your envelope is not a good idea as they will get crushed and damaged by the time they reach Santa. Santa much prefers to eat his treats on Christmas Eve, so please have your children save them at home for the big day! Samples from this weeks classes! 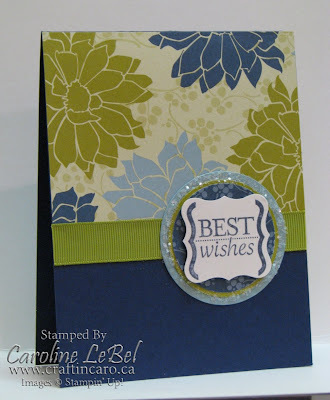 Woooweeee -- it's sure going to be a crazy but fun week here at Caroline's Studio as I have 3 great classes planned for your stamping pleasure. Details on the classes (fees, times, RSVPS, etc) can be found on my Events page. That's always the best place to check and see what classes I have coming down the pipeline! Let me know if you want to come out to play -- would love to see you! What happens when you combine some Designer Series paper, a small Décor Elements and a $1.99 frame from Value Village? Well, come and take a look for yourself! 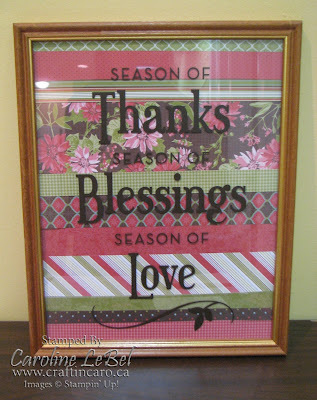 It was as easy as applying the "Season of Thanks" Décor Elements (12" x 7-5/8" in Old Olive vinyl) to the glass front, and then covering both sides of the cardboard backing with different themed paper. 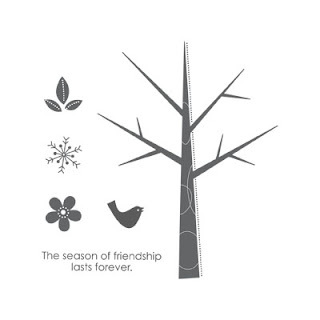 Haiku for the fall, and Holiday Treasures for Christmas. See how easy gift giving can be when you put to use all your favourite SU goodies? 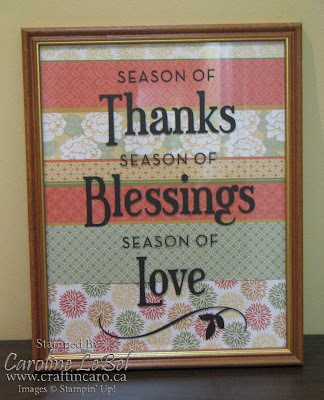 :) You can hang the "Season of Thanks image" in your home to remind you and your loved ones of everything you have been blessed with. 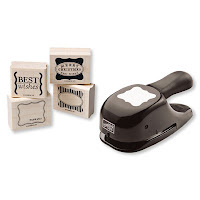 The Secret Stampin' Sale that even *I* don't know anything about! How's that for a wacky blog post title??!?! 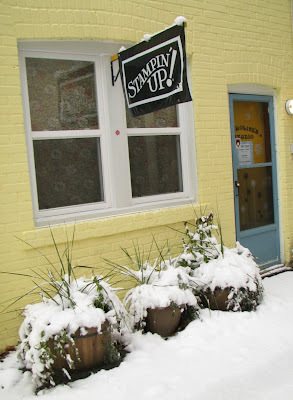 But it's true -- Stampin' Up! has been teasing us with hints of a great big Holiday Extravaganza Sale that will be held this week to help correspond with US Thanksgiving, traditionally a big sales period in the United States. This sale will be held on Wednesday November 26 to Monday December 1 and has been designed specifically to appeal to those crafting shoppers who are looking for a great deal before Christmas. Hey, this here Canadian gal won't be complaining, since I like a good sale as much as the next chick! So I'm here to just give you a heads up that you WILL want to check back early on the 26th for all the details as they are released. P.S. The 26th is also my Serena Bean's 11th birthday, so you had better bet that I'll have an EXTRA SPECIAL deal happening for anyone who orders on that day. WOOHOO! 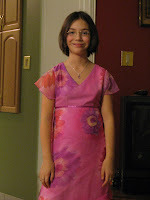 Today I get to go and see Twilight with my SerenaBean -- to say she's excited would be a serious understatement. I got a real kick out of reading Shelli's blog a few days ago when she talked about how she and Sterling got hooked reading the books last week in Hawaii! The photos of her reading it in the pool, at the table, in the car and in her jammies really cracked me up. 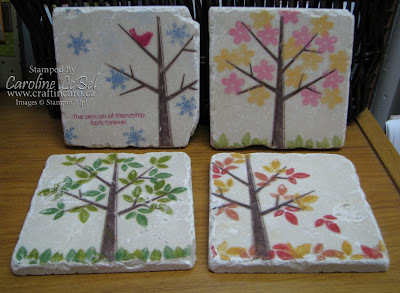 Today's share will be the marble coasters we made last week at one of my Saturday classes. 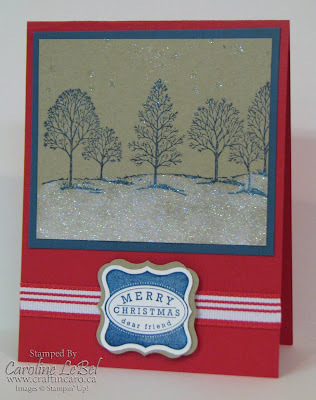 They're done in a 4 seasons motif using the Season of Friendship set from the Holiday Mini catalogue. 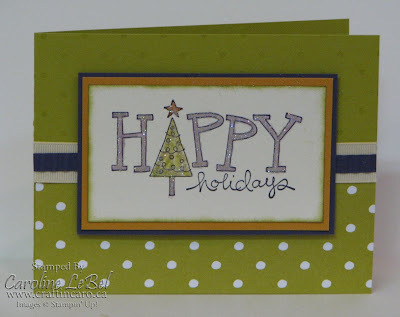 Day 18: Holiday Stepper Boxes & Welcome! My belly is sending out an extra-special thanks to Iva for bringing the yummy pie & chocolates, even if it means an extra 1/2 hour on my Wii Fit tomorrow! 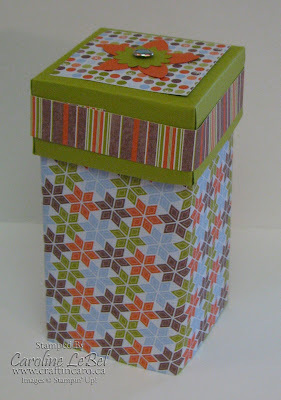 Today I want to share with you the holiday Stepper boxes we made last weekend. 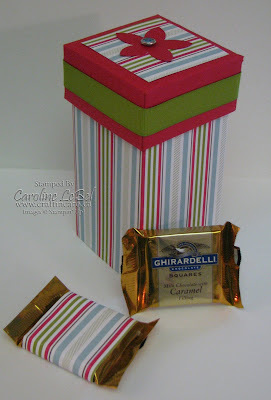 They fit those delicious Ghiradelli chocolates... ooh la la! These next ones were made Saturday evening when some of my "Canadians, INK!" demonstrators got together for some wine, chocolate and stamping! Tomorrow will be the marble tiles we stamped, so come back to check it out! Hey there gang, it's time to get ready to celebrate the weekend, 'cuz it's Friday!!! Let's just ignore the -15 windchill outside, shall we? 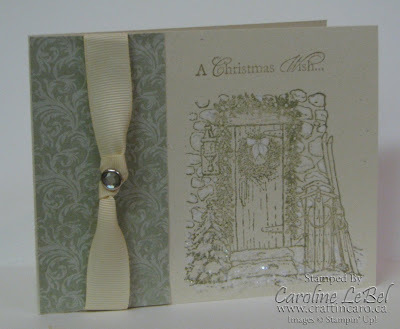 The past 2 days I have featured 6 of the cards for tonight and tomorrow's Holiday 10 Cards Class (see them here and here) so here are the final 4 for you to enjoy. 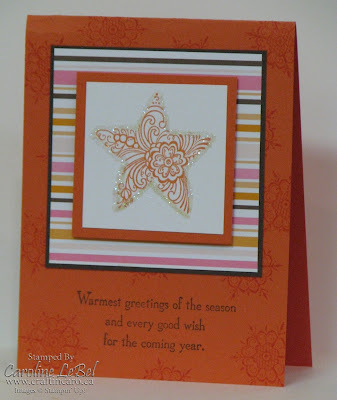 FYI, do you remember me telling you all about how much I love checking out the card samples on Stampin' Up! 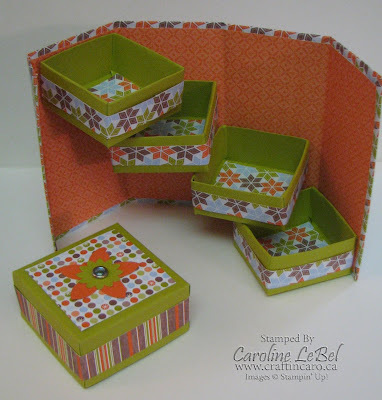 's Stampers Showcase? 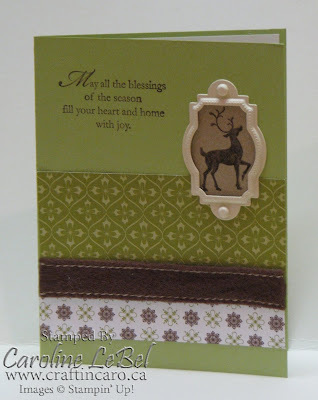 Well, this first reindeer card was based on a beautiful card made by Tepa Farias that I saw there. 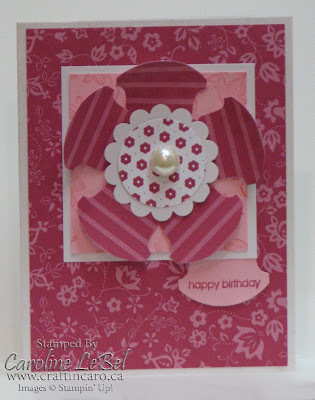 I just changed the colour scheme to use different Designer Series papers & ribbon, but the inspiration was all hers. Sigh...I just *love* being a demonstrator!!! Don't neglect the insides of your cards! Make 'em pretty too, just like the envelopes. What's the expression I always tell everyone?? NO NAKED ENVELOPES! Happy Mail day from a Blog Candy Winner! Look what lucky me received in today's mail! 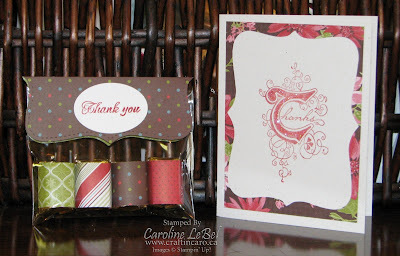 It's a beautiful "Thank You" card from my recent Blog Candy winner, Kerry J. 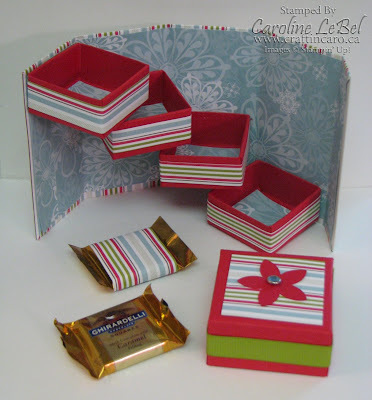 She won the Level 1 Hostess gift, "Patterns Pack Designer Series Paper", which ad 60 sheets of double-sided designs in 5 cool colours. 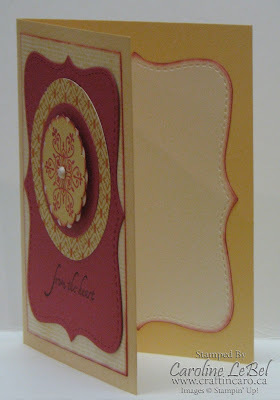 And for the record Kerry, I totally forgive you for using your Cuttlebug on the card -- LOL! :) Thanks a bundle for the gorgeous card, I'm so happy you've been enjoying your prize! This morning everyone was fluttering around madly ("Mom, where are my boots?" followed by "Mom, my boots don't fit!") trying to get ready to go out in the snow for the daily walk to school. So maybe no one had matching gloves, hats or scarves, but that was okay. It took us at least 10 minutes longer then usual, what with all the impromptu snowballs being flung willy-nilly. My kids are true Canucks and LOVE the white stuff something fierce. MOVING ON TO TODAY'S CARDS! 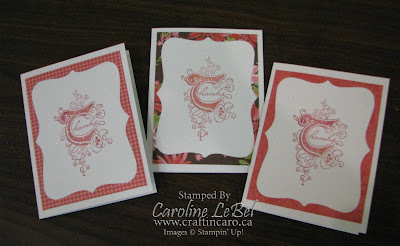 Here are three more for this weekend's Holiday 10 Cards Classes. Saturday's classes are almost completely filled so please contact me ASAP if you want me to save you a spot for either day! Accessories: Ivory Wide grosgrain ribbon, paper piercer, Clear Rhinestone Brads, Blender pen, 2-way glue pen, chunky clear Glitter.